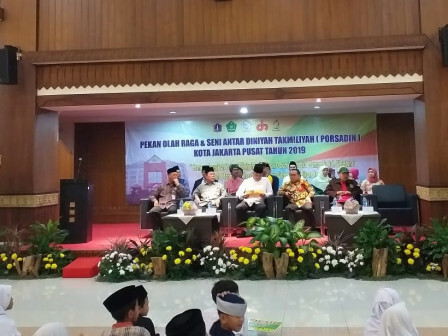 Central Jakarta Mayor, Bayu Meghantara opens the Sports and Arts Week between Madrasah Diniyah Islamic Center schools (Porsadin).
" Education is an investment and must start from now"
It is one form of education for early childhood in the fields of sports and art. "Education is an investment and must start from now," expressed Meghantara, Sunday (3/31). It is hoped that every student could win this event at the provincial level and also at the national level which will be held in the forthcoming August. As for the information, the national level will be participated by 800 participants from 89 schools with 12 art competitions, ranging from national Quran recital (MTQ), calligraphy, quiz, coloring, speech, soccer, sprinter running, badminton, and table tennis.